The third week of November I had the great pleasure of being one of four bloggers invited on the second-leg of a tour covering all the eight provinces in Andalucia. My four provinces were Cadiz, Cordoba, Huelva and Sevilla. As you can imagine we didn't see very much of each province, one per day. But I and my fellow 'trippers' certainly enjoyed what we saw and experienced. 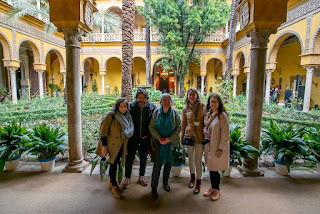 So here follows a brief resume of our four day trip with Tasty Andalucia. If you'd like to check it on on Social Media the hashtag is #Andaluciatasteslike on Facebook, Twitter and Instagram. You might even find my accounts and want to follow me! 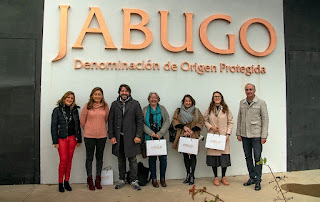 Our first visit was to learn about Jamon production in Jabugo at the innovation and promotion centre for Jabugo Jamon DOP (Denominacion de Origen Protegida) or for us Protected Designation of Origin). They are responsible for checking the quality of the pasture lands, the drying rooms and cellars. They also verify the breed of the pigs and check their nutrition during the final grazing period and also inspect the drying process of the hams, front legs (paleta) and back legs (pata). 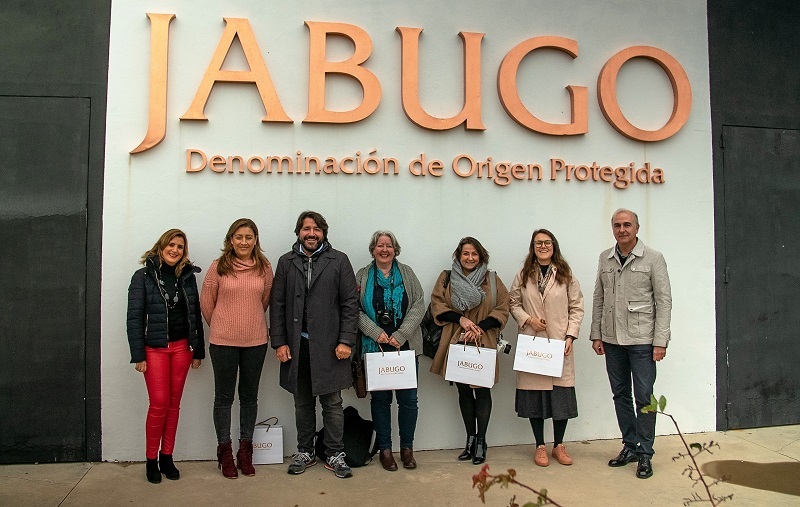 Only the jamons which pass the quality standards and come from the area covered by the Jabugo Protected Designation of Origin are sold as Jabugo Jamon. The centre is in a wonderful old hunting lodge in the town of Jabugo in the Sierra de Aracena y Picos de Aroche, not far from the borders with the region of Extremadura and Portugal. It's an enormous natural area of mountains and pastureland. After our introduction to the DOP Jamon and a goody bag to take away we headed to some of that pasture to see the pigs at large. We went onto to the tiny town of Corteconcepcion to get our feet muddy, stroke the pigs and admire their lands. Full of oak trees, these ancient protected areas are ideal, safe grazing for pigs. Not so ideal for our city shoes, but after plenty of rain the ground was a little boggy and without incident we admired the different breeds. Some hairy, others more like hippo-skin they happily milled about us snorting and snuffling as they followed the corn trail leading them back into the enormous area of pasture. Cute when not too close. We then visited the drying and storage rooms, learning about the natural ways, learnt from their forebears, of salting and air drying the meat. Once a necessity of survival from year to year. It's the dry, pure air as well as the natural grazing and breed of pig that makes this jamon so special. Pata Negra the best jamon comes from a 100% Iberian pig that eat only acorns for the last 3 or 4 months of their life. This is the stage where they can go from 80 kilos to 160 kilos. The pigs can't eat acorns until they are 10 -12 months old, then after doubling their weight grazing on the three types of acorns that grow naturally on the pastures, their happy life ends at about 1.5 years old. Then to produce the jamons in the natural way it can take up to 3 years to cure them by the salting and controlled air drying process. 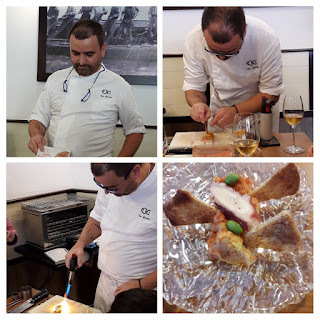 Jamones Eiriz have a wonderful living room/restaurant where we tasted many of the fabulous products they produce. Not only Jamon but also lomo and chorizo amongst other products. 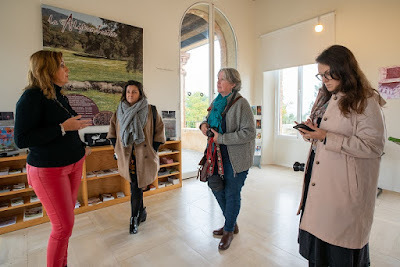 Our next stop was the Vino de Condado de Huelva visitor centre for an introduction on the area included in the DO. A very light, airy and modern centre (I loved the building and took a million photos, both inside and out) with lots of information about the towns and the history of wine and vinegar in the Condado. 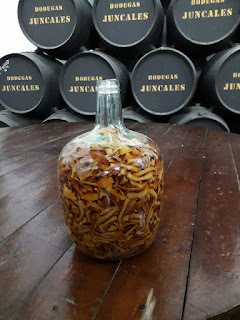 And then to the small, family-owned Bodegas Juncales one of the wineries within the DO. 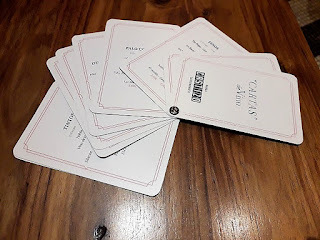 For a small winery they produce 11 wines and we dined while sampling 7 of them! One of them an Orange Wine, which at the moment is only produced by the Condado de Huelva DO. Needless to say I liked all of them. The orange wine too, not for daily quaffing but as a desert wine or occasional wine it was extremely pleasant. Day two arose drizzly and cloudy but we went off to see Seville. Our first visit was to the 'Setas' as the locals call it. 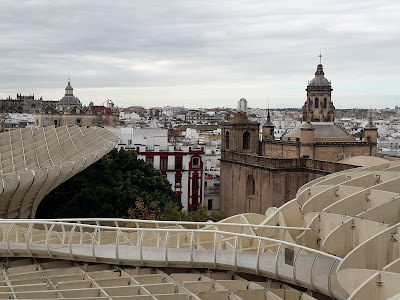 It's official name is Metropol Parasol designed by Jürgen Mayer and built in 2005 it was my first visit. I'd seen plenty of photos but non prepared me for the vast size of the setas. Setas means wild mushrooms in English and it does have an appearance of mushrooms. With lots of walkways and view points giving vistas across the city and I presume beyond on a normal clear blue sky day, we were unlucky. It's a fascinating construction and I'm taking hubby there on our next visit. We then headed to the Palacio de Las Dueñas another wanted-to-visit spot. 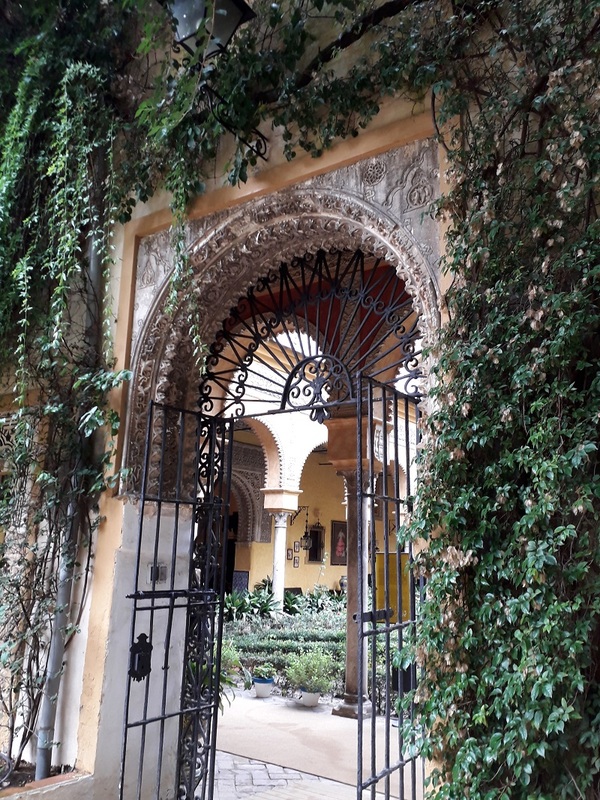 Home to the late Duchess of Alba and built in the XV century in the mudejar-gothic style. Its rather plain entrance belies its marvellous interior and grounds. I could have wandered here all day, but alas time was short and we were late! Moving on to the Ines Rosales biscuit factory just outside Seville we were treated, bedecked in white coat and cap, to a factory visit and what smells! 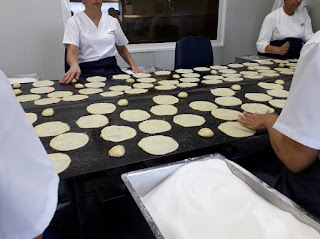 Not being a lover of Aniseed I didn't appreciate it as much as the others, but the whole process was fascinating, especially the dexterity and speed of the jolly ladies hand-flattening the tortas. The history too. 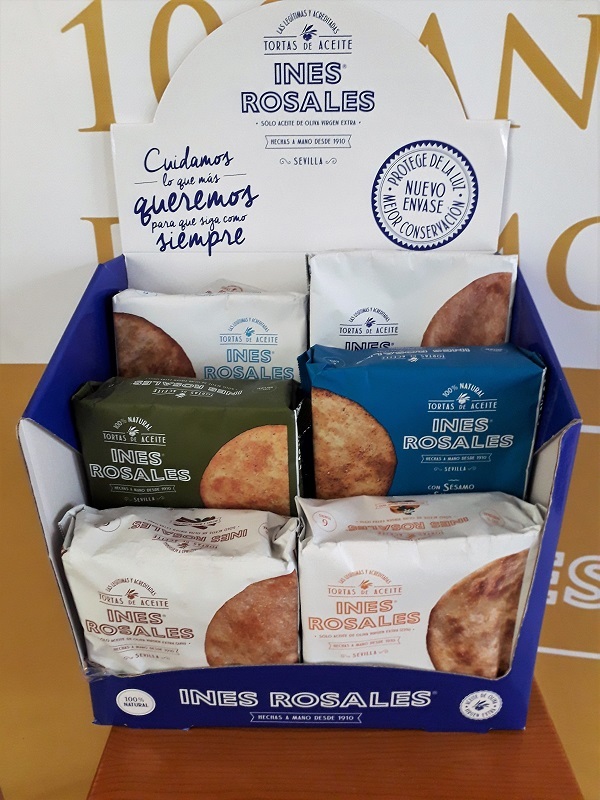 Ines Rosales was the name of the woman who began baking these 'tortas' using an old family recipe. She began to do so as a way of supporting her family. Heading each day to Seville train station she sold her fare which soon became popular and sort after. Then I learnt they do other flavours. Another sweet one is orange flavoured, the other a tasty Rosemary and Thyme, just perfect with cheese and for me. 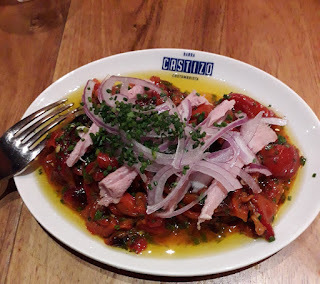 We then went to Restaurant 12 Tapas which had laid on a tasting menu with each dish being prepared using one or other of the tortas. Just brilliant. 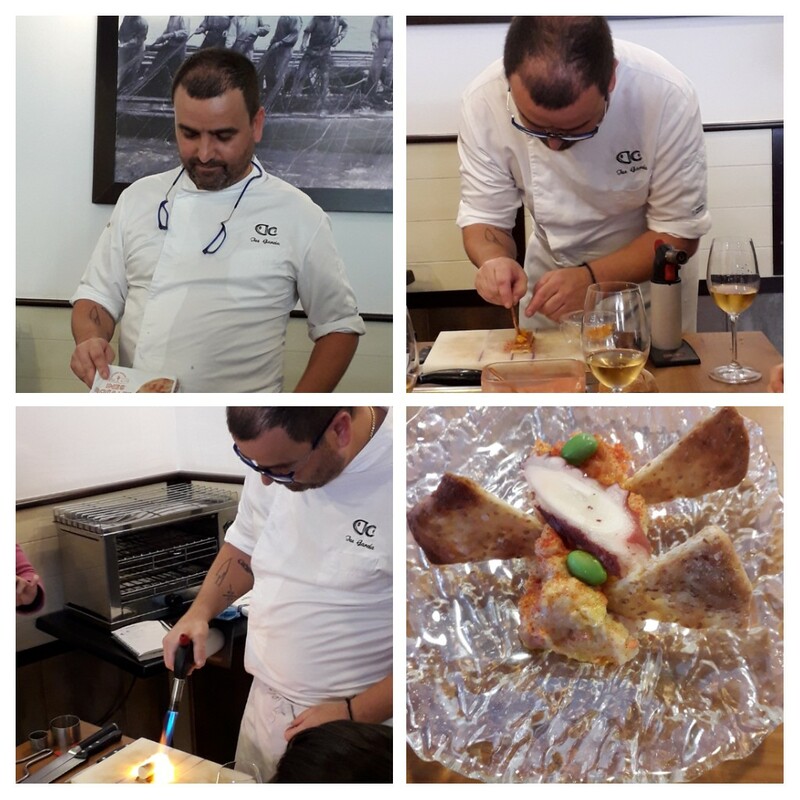 Each dish was prepared by chef Túe García at our table with others 'prepared earlier' for all of us. I shall be returning there too. After lunching so well I was very pleased we'd be walking and not sitting. 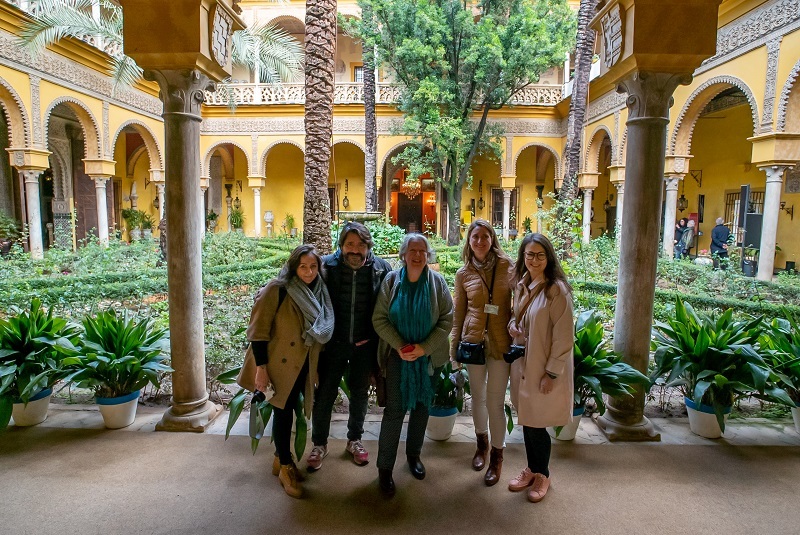 Our destination was the Alcazar. Again we were behind schedule but thanks to Mercedes we snuck in after last entry time and had a rather quick visit. Again I will be back. The exit leads onto Plaza Banderas (the first photo) then through the maze-like narrow streets we explored a bit of Seville. A place to get lost and just chill in the mass of cute lanes and flower-filled tiny plazas. It was then time to eat again. 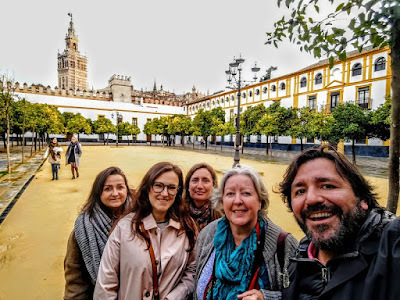 We headed to into Seville for dinner and to await Margarita our fourth companion. Bar Castizo had the most unusual wine list I've seen for a while. Not particularly hungry and being four females (not including our lovely guide Rafa) the dishes ordered were quite sparse but very good. Except for a rather odd Salmorejo (normally my favourite) garnished with soggy fried potatoes. And there ended another busy, tasty day in Andalucia! Second part, Day 3 & Day 4 will be on the block soon. Read my post over on my Luxury Spain Travel blog about Bodgeas Hidalgo - La Gitana the winery we visited on the last day of our trip.